Directed by Patricio Guzman, The Battle of Chile Pt. 3: Popular Power is the third and final film of a trilogy of documentaries chronicling the events of the September 11, 1973 coup d’etat as the film explore the Unidad Popular movement from March of 1972 and how it managed to defy the odds against conservative forces before the end of Salvador Allende’s rule as president of Chile. 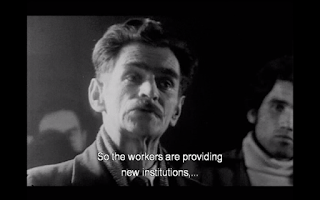 The film follows the same visual format but it is more about the rise and fall of Unidad Popular and how it managed to connect with the people at a time of conflict with the conservative and bourgeoisie as it’s narrated by Abilio Fernandez. The result is a compelling and somber film from Patricio Guzman. Shot from March of 1972 to the summer of 1973 before the coup d’etat of September 11, 1973, the film is an exploration into the Unidad Popular party and its methods to keep Chile going despite the strikes and shortage of supplies led by the more conservative Christian Democratic party with the aid of U.S. government. The film follow not just the events where Unidad Popular would defy the odds and create a system for themselves but also find ways to create a community amidst the political turmoil in the country. While many of the views in the film definitely lean towards Marxism/socialism, it does showcase what the working class in Chile are dealing with against the opposition that is largely bourgeoisie. The film is more structured than its predecessors where it focuses on what is going on in the streets and in working class areas in the first half while the second half is more about land owned by rich landowners that aren’t being used as well as the plight of the miners and workers at repair shops. The first half focuses on an attempted trucker’s strike which was driven by both members of the conservative/bourgeoisie members of congress with the aid of the U.S. government as they try to stop supplies from being reached to the people in an act of defiance against its president Salvador Allende. The second half showcases the movement against landowners who refuse to have their land used to create crops and resources for the country where workers do whatever they can to fight the landowners. Patricio Guzman’s direction is definitely straightforward with its usage of hand-held cameras as it’s shot in black-and-white with the aid of cinematographer Jorge Muller Silva (whom the film is dedicated to) as it play into the events that is happening with Guzman talking directly to the people in their plight. Especially as they try and support Allende as much as they can. Editor Pedro Chaskel would gather some news footage and interviews that play into the situations where Guzman and Silva would go inside the mines or see how workers do whatever they can to get the needed supplies to the people. The sound work of Bernardo Menz would capture the sound of those protest marches during those times as it play into the growth and power of Unidad Popular and the influence it would have in various industries all over Chile. The film’s music by Jose Antonio Quintano is mostly low-key as it largely consists of traditional woodwind music to play into some of the quiet moments where the movement had succeeded despite the dark times what was to come. The Battle of Chile Pt. 3: Popular Power is a remarkable film from Patricio Guzman. While it’s a more somber documentary that is focused on the people who are part of a movement against the more traditional and bourgeoisie society in Chile. It is still a fascinating film that explore the ideas of socialism as well as a country’s attempt to maintain a sense of community during a tumultuous time in Chile’s history. In the end, The Battle of Chile Pt. 3: Popular Power is a marvelous film from Patricio Guzman.